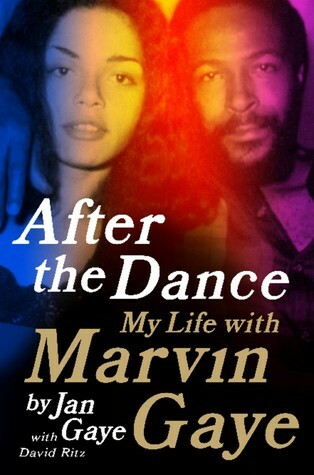 After The Dance: My Life with Marvin Gaye. Jan Gaye with David Ritz. In ancient African religious systems, Ibeji (an Orisha, from the Yoruba and the Ifa) is known as the deity of twins, while Ma’at (from Egypt) was the goddess of, among other things, balance. This book, a memoir of a talented, troubled attractive young woman who falls in love with an equally troubled man whose voice and lyric reverberated around the world, tells a story that screams for their intercession. If these gods did act, they chose to abruptly end the dualities that circled around them like cocaine and marijuana: when Marvin Gay Sr. murdered his son in 1984 with the gun the son had purchased, it almost seemed like either an evil or heavenly release of all of the tension, anger and depression that had wafted around the singer. The entire book is awash in 1970s post-Civil Rights Movement euphoria. Music, television and performance made gods of men and women, flawed human beings who were openly worshipped and adored. Marvin Gaye was the first Motown artist to break free of the company’s strict formula; to demand artistic freedom. He became his own Black Power Man, with his own studio, his own musical ideas and with his own family separate from Motown—the one he created with a young teenage girl he saw while in the studio. He sang a song to her, this surface ingénue, who was, and perhaps would always be, his premier acolyte. They were almost instantly conjoined by sensuality, by spirituality, by pain and the promise of enjoying, and finding home in, the new freedoms available. In this book, the Gayes are twins of pain, cycling through, and back to, their dysfunction. Their marriage, Gaye’s second, eventually ended in the early 1980s (“The struggle to stop struggling was finally over”). Artistically, Marvin Gaye was on a comeback. Unfortunately, he did not have the chance to exorcise his personal devil—the one that had his name on it, written by his own hand—even though he knew he had to give it up. His father’s sick need to win their competition dominated, and a talent stilled, existing forever in a musical loop, a skullcap covering his head like a crown. Marvin Gaye represented African (-American) people’s joy and pain like few artists in the 20th century. Janis Gaye’s story emphasizes all of the edges of the disjointed souls these drama junkies occupied and shared with each other, grasping for an elusive peace while naturally plotting ever-accessible turmoil. It is the story of a couple who needed love, and found it, but failed to create a life that belonged only to themselves, because ultimately, even when it was just the two of them, there were just too many sides to satisfy. This entry was posted in american history, books, music, news, radio and tagged "Here My Dear" album, "I Want You" album, "Let's Get It On" album, "Midnight Love" album, "Motown 25" television special, "What's Going On" album, 1984, After The Dance, David Ritz, Jan Gaye, Janis Gaye, Marvin Gaye, Motown. Bookmark the permalink.